In this abridgement of River-Horse, the pre-eminent chronicler of American back roads -- who has given us the classics Blue Highways and Prairyerth -- recounts his singular voyage through American waters from sea to sea. Along the route, he offers a lyrical and ceaselessly fascinating shipboard perspective on the country and its rivers, lakes, canals, and landscapes. Brimming with history, drama, and wisdom, River-Horse belongs in the pantheon of American travel literature. 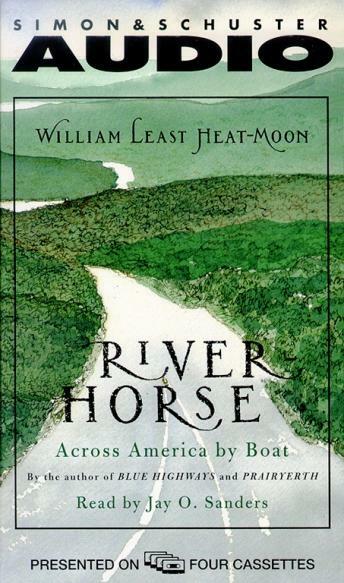 In his most ambitious journey ever, Heat-Moon sets off aboard a small boat he named Nikawa ('river horse' in Osage) from the Atlantic at New York Harbor in hopes of entering the Pacific near Astoria, Oregon. He and his companion, Pilotis, struggle to cover some five thousand watery miles -- more than any other cross-country river traveler has ever managed -- often following in the wakes of our most famous explores, from Henry Hudson to Lewis and Clark. En route, the voyagers confront massive floods, submerged rocks, dangerous weather, and their own doubts about whether they can complete the trip. But the hard days yield up incomparable pleasures: strangers generous with help and eccentric tales, landscapes unchanged since Sacagawea saw them, riverscapes flowing with a lively past, and the growing belief that efforts to protect our lands and waters are beginning to pay off. And, throughout its course, the expedition enjoys coincidences so breathtaking as to suggest the intervention of a divine and witty Providence. Teeming with humanity and high adventure, Heat-Moon's account is an unsentimental and original arteriogram of our nation at the edge of the Millennium.